Present day Hayes Township still retains evidence of its first inhabitants, the native Americans, and later the farmers and lumbermen who were its first European settlers. Log-constructed Greensky Hill Church (United Methodist) stands just off Old US 31 North, near the “Circle of Council Trees” once used by the Native Americans. Greensky Church was started as an Indian Mission in the home of Zu Zopf, and a burial ground is nearby. The Undine Cemetery on the Boyne City Road is the burial ground for other early residents of the Township. Several one-room school buildings, including the Undine and Hopyard, both of which closed in the 1940’s, remain and have been converted to private uses. The Maple Grove School was moved to Petoskey in the mid-40’s and now houses a church. The Murray School, a red brick building on the corner of Upper Bay Shore and Murray Roads, was closed in 1965 and is now a residence. The Maple Grove Grange Hall on the corner of Maple Grove and Church Roads served the agricultural community for over 70 years until the Grange was disbanded in 1986. Two areas of the Township tended to become population and business centers during the latter 19th and early 20th centuries, the heyday of the lumbering industry. At Burgess Corners, a sawmill owned and operated by Burgess and Lynnie Cooper stood by the railroad tracks until the early 1900’s. Bernie Newsom ran a large general store at the corner of Burgess Road and Old US 31 North, which burned in the early 1940’s. Burgess Corners lost its final commercial establishment in the early 1950’s when a store and gas station closed. Bay Shore also became a busy industrial and commercial community during the 1900’s. The kilns of the Bay Shore Lime Company, which have not operated since 1930, baked limestone quarried off US 31. 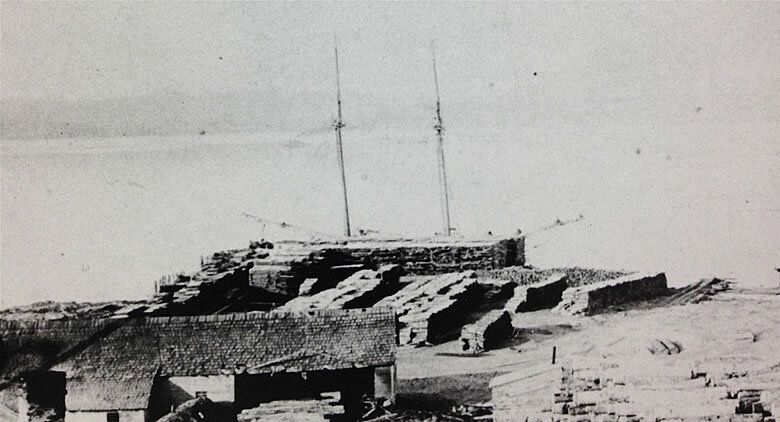 The sawmills of the Bay Shore Lumber Company prepared high quality timbers for shipments to Detroit and Chicago. The lumber mill also produced broom handles as a by-product, making Bay Shore a multi-product manufacturing community. Loggers for miles around furnished the four-foot pieces of wood used for fuel by the kilns. Three fire hoses stood guard near the town houses because the kilns, operating twenty-four hours a day, created a constant fire hazard. A modern three-story hotel served travelers to Bay Shore until it burned in 1914. The large general store in the center of the town provided dry goods and hardware on one side and provender on the other. The hall above the store offered a meeting place for the Macabees and the Oddfellows, a dance floor for the lively, and a cozy place for friendly conversing. Bay Shore boasted an additional grocery store, a blacksmith shop, meat market, barber shop, ice cream parlor, and saloon. The early Bay Shore had a band, a ball team, and at one time free movies were shown on the outside wall of a store. Games on the bluff, school dances in the hall over the store, ice cream socials, and maple syrup making were other forms of entertainment. Daily trains left Bay Shore for Petoskey, at 10 a.m. and returned at 2:30 p.m. Catholic and Presbyterian Churches served the community. Today Bay Shore is an unincorporated village, largely residential in nature, but commercial establishments in the area include a general store and gas station, automobile dealership, a trucking terminal, and a road building company with its gravel mining operation. The Oyster Bay area was the location of summer camps on the shores of Lake Charlevoix, on acreage also known as Struthers’ Estate. This was a popular summer camp for boys until its closing in the early 1970’s. Since the closing of the camps, the site has been developed for residential use. attract summer residents, who bought large parcels and built seasonal homes. In recent years, new home construction has increased in Hayes Township as more people have moved north to become part of the growing year-round economy of the region or to become seasonal home owners. With passing generations, many of the large parcels along Lake Charlevoix have been divided, resulting in the growth of year-round lakefront homes on smaller parcels. Resort-oriented subdivisions, developed in the 1970’s at Susan Shore, Birdland Estates, Michigan Shores and Pine Point, have evolved into year-round residential areas. The interior of Hayes Township was largely agricultural, primarily beef and dairy cattle and crops such as potatoes and beans. In the past twenty years many agricultural lands have been divided with areas once agricultural becoming residential. Whereas agriculture was the mainstay of the Township forty years ago, it is now estimated there are fewer than a half dozen full-time farmers in the Township. Thus, while retaining its characteristic open spaces and forestlands, Hayes township is less of an agricultural community than it has been in the past. Similarly, while there has always been a commercial and industrial factor in the Bay Shore area, the major growth in the past twenty years has been more residential in nature.